The above post has been re-blogged now that the San Francisco Declaration has been created which has been endorsed by Science. The San Francisco Declaration is looking to challenge some of the strategic games being played in the world of academia to increase productivity, get tenure and climb the rankings. These games could easily lead to both a decline of scientific quality and an erosion of trust in science all together. Below there’s an exerpt from the editorial that can be found in Science (see also: http://www.aaas.org/news/releases/2013/0516_impact-factors.shtml#fb). The San Francisco Declaration can be found here:The San Francisco Declaration. ———————- —————–A measure developed to assess the quality of scientific journals has distorted how research is evaluated, and should be not be used to judge an individual’s work, Science Editor-in-Chief Bruce Alberts writes in the 17 May issue of the journal. The editorial coincides with the release of the San Francisco Declaration of Research Assessment (DORA), which grew out of a gathering of scientists at the December 2012 meeting of the American Society for Cell Biology (ASCB). More than 150 scientists and 75 scientific organizations including Science’s publisher AAAS have endorsed DORA, which recommends specific changes to the way scientific journal rankings are used in hiring scientists, funding research and publishing papers. ———————————————————————One of the most popular ranking measures, called Journal Impact Factor or JIF, ranks research journals based on the average number of times its papers are cited by other papers. (The higher the JIF score, the more often its research papers are cited by others.) JIF was devised to rank journals, but is now often used to evaluate an individual’s research, by looking at whether she or he has published in high-score journals. Alberts notes that an unhealthy obsession with journal ranking scores may also make journals reluctant to publish papers in fields that are less cited, such as the social sciences, compared to papers from highly-cited fields such as biomedicine. ————————————–The DORA guidelines offer 18 specific recommendations for discontinuing the use of JIF in scientists’ hiring, tenure, and promotion, along with ways to assess research on its own merits apart from its place of publication. “What’s your h-factor?” is a question that is increasingly asked at gatherings of scientists or during interviews for academic positions. Scientific careers depend on h-factors these days. What am I talking about? The h-index is an index that attempts to measure both the productivity and impact of the published work of a scientist or scholar. The index is based on the set of the scientist’s most cited papers and the number of citations that they have received in other publications. The index can also be applied to the productivity and impact of a group of scientists, such as a department or university or country. “There is an online market for so many intangible goods these days that it should come as no surprise that there is a market for Facebook “Likes” — the little thumbs-up rating that accompanies so many products and services we see on a daily basis. For $75, a marketing company will sell you 1,000 Facebook “Likes,” according to NPR’s Planet Money. Only the marketing company does not supply the “likes” but works as a broker between real individuals who are willing to sell their online preferences to your product for very small sums of money — ten cents a “like” — and those who wish to artificially inflate their prestige. And later on Phil writes: “The artificial trust market is not new and is found in environments where online trust is important, such as purchasing an antique love seat from a complete stranger on eBay, finding a reputable bed and breakfast in rural Ireland, selecting a new e-book from Amazon, or choosing an app from the Apple Store. When in doubt, our tendency is to turn to the wisdom of the crowds because we believe that these ratings are accurate evaluations generated by honest individuals and based on real experiences. He then refers to my earlier post where I suggest a website like PleaseCiteMe.Com where ‘academics’ can ‘purchase’ citations to increase their h-factor… see my original post below. A scientist has index h if h of his/her Np papers have at least h citations each, and the other (Np − h) papers have no more than h citations each. An important determinant of the hight of one’s h-factor depends on what counts as a ‘ cite-able publication’. In the Web of Science h-factor only scientific articles published in journals which have ISI-recognition (determined by Thomson-Reuters) are considered citeable (so not articles in other journals, chapters in books, etc.). In the Scopus h-factor a larger pool of journals is included, while in google citations and in ‘publish or perish’ (www.harzing.com/pop.htm) the h-factor is likely to be higher as it also considers articles in a wide range of journals, book chapters and reports as cite-able). In my university, Wageningen University, it’s not your x-factor that matters but your h-factor. Our librarians have become information specialists that have expertise in bibliometrics and scientometrics. Such expertise is pivotal in helping our academics, science groups and, indeed, our university (76th on the Times Higher Education Index…) climb the rankings. Biblio-what? 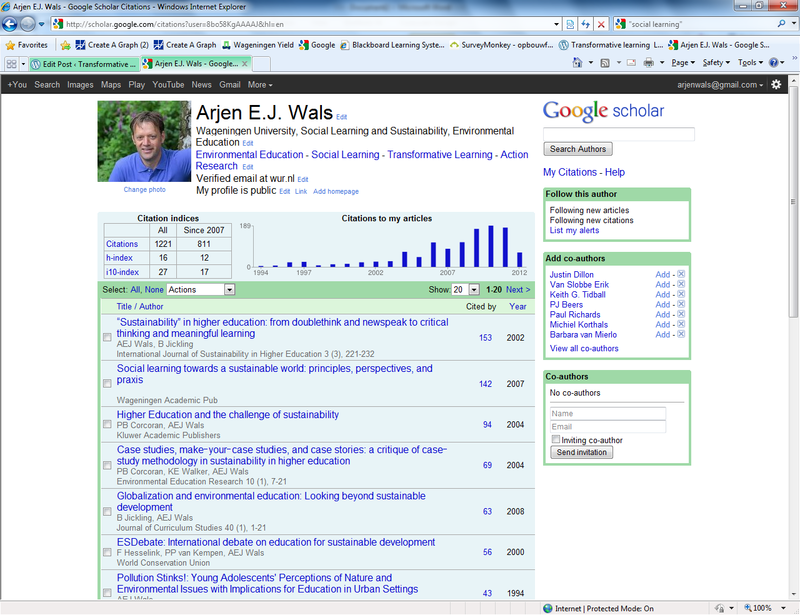 Below you will see a screenshot of my personal bibliometrics (click on the image to make bigger). As you can see my overall h-factor is 16. Impressive? Hardly. But how can I raise it? Let me move to the crucial information google citations provides (if you want to check your own bibliometric data you need to make a profile on google citations!). 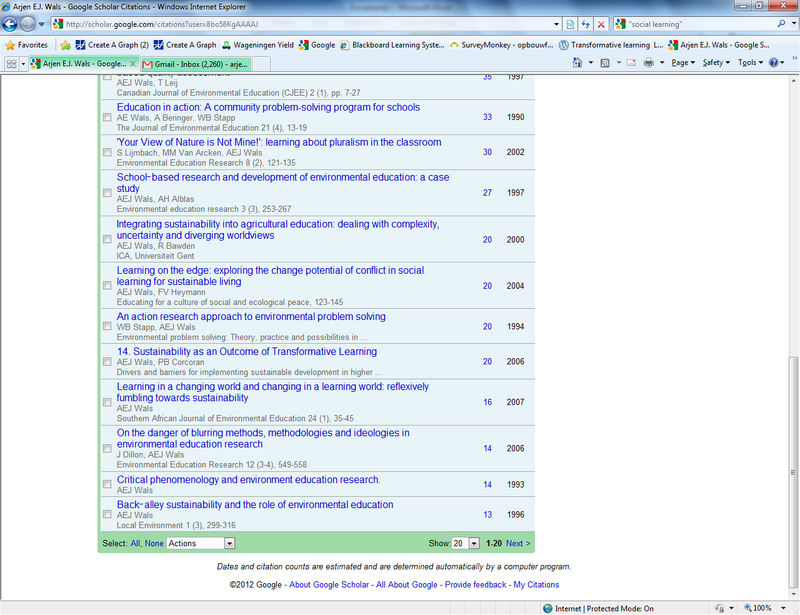 You will note below that “Learning in a changing world and changing in a learning world: reflexively fumbling towards sustainability” is the crucial paper at this moment (click on the image to make bigger). If I want to increase my h-factor to 17 then I need to get two of my papers cited 17 times or more. I could try to promote the paper that currently occupies place 16 (“reflexively fumbling”). I would then also need to find another paper that is still somewhat attractive to be cited – perhaps the 2006 paper with Justin Dillon on “The danger of blurring methods….” . Why not develop PleaseCiteMe.com – a web-based system where people can trade citations. Scholars can post citations of their own work that they need to have cited in order to increase their h-factor. Of course there is a price to pay: the scholar will have to cite the work of the scholar on the other end who agreed to cite the work. If this is not possible then there can be a monetary value attached to a citation. Possibly citations in a Web of Science journal might cost more than citations in a Scopus journal or of a book chapter that is recognized by Google citations. Of course we need to have a few clever web-designers, economists and Mark Zuckerman-types to create all this but then by 2014 we could probably take this to Wallstreet as by then will be a huge demand in the world of science for this service. So what are we to do? In the end it is not about science for impact factors or h-factors but science for impact in society. Some of us are part of a system run increasinly by bibliometric information. Playing the game may be inevitable until the game will end, when people begin to realize that people don’t read but only cite… or when people only write without having the time to read… or when strategic thinking replaces intelligent thinking, curiosity and passion for contributing something meaningful to people and planet. Fortunately there are still academic environments driven by societal relevance, planetary responsibility and curiosity. And, indeed, there are calls for bridging science and society and other forms of reviewing quality in research (see for instance Funtowitch and Ravetz idea of the ‘ extended peer review’). More on this in another post!